Warren is a certified Master Peace Officer in the State of Texas with 14 years experience and over 2500 hours of specialized training. Throughout those 14 years Warren has worked in local law enforcement with assignments in judicial protection, warrants, investigations, sexual offender task force, training and narcotics. He currently holds the rank of Captain and leads a reserve division of a local law enforcement agency. 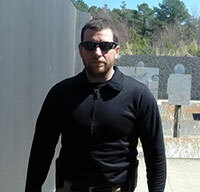 Since Warren founded JWM Tactical Training and Protection Services LLC in 2005, he has instructed over 2000 students on topics from handgun safety, basic marksmanship, concealed handgun license and tactical handgun/rifle applications. Warren has trained first time shooters, local state and federal law enforcement personnel, active military and private security contractors assigned to executive protection and those deploying to high threat locations. Warren has planned and executed personal protection assignments for polarizing public figures as well as a United States Congressman and worked with the State of Texas Governors Protective Detail. Warren has had the opportunity to be trained by, and to train with, active and former members of special operations groups. Since 2010 Warren has provided Personal Security Detail services for the executive leadership of a Houston based international oil and gas company. Warren obtained a Bachelor of Science Degree in Criminal Justice from Sam Houston State University in 2008, a world renowned Criminal Justice College; and returned for a Masters Degree in Criminal Justice Leadership and Management in 2011.